I promise I'll stop complaining about this miserable heat. In November;) During the day I don't wear much makeup (much being the key word-I still do even to the beach!) Tonight we'll be going to a bar/club, so I thought I'd spruce up my makeup routine. I've been using the new IsaDora BB Cream* in Tan. I love BB creams. I think for summer BB creams are the best thing for your skin. SPF and extra moisturizer equal a happy, healthy complexion. Since I have an oily t-zone I apply MAC SFN with my beauty blender (a trick I learned from pemberleyjones.com-love her site and her amazing Make up and Skincare tips). I simply wet my beauty blender a bit and it doesn't spread my BB or concealer around as I thought it would. I lightly pat it just where I need it. Great finish! Next, I apply a bit of concealer-am still LOVING my Collection Lasting Perfection I received from Mags in our swap. It has great staying power and doesn't crease. Also sent in the swap was this MUA Blusher in Shade 4- The pigmentation of this blush is amazing. I usually wear a cream blush underneath all my blushes for lasting effect, but seriously have not needed to with this one! On my lips I'm using something simple since I'll be eating and having a few beverages: Revlon Lip Balm Stain in Honey and a bit of Korres Quince Lip Butter (this one smells soooo yummy!!!!) I really like the Revlon Lip Stains but they are a bit drying-Korres' lip butter makes my lips more moisturizing and adds a spot of shine too. I Love playing up my eyes for a nighttime look. Again I'm using products I was luckily given in my swap: 17 Blow Out Jumbo Eyeliner Blackest Black on the waterline, for a smudgy-smokey look. 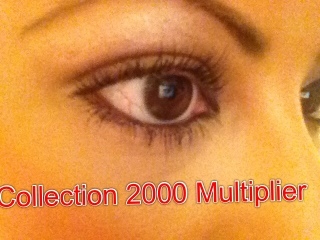 On my lashes Collection 2000 Multiplier Volume &Definition Mascara. To finish it off and make sure it lasts, I spray one or two pumps of Urban Decay De Slick Oil Control Makeup Setting Spray. I'll admit-never gave much thought about setting sprays. But this one (in my opinion) is fantastic and honestly does help my makeup last longer and shine free. Will definitely be repurchasing! Has anyone tried this (or any other) setting spray? * Product received for PR Consideration. My Blog, My honest opinions-Always. Aw you have such long, gorgeous lashes, Yessie! I'm jealous :P And Honey is definitely my favorite Revlon Balm Stain too--but they are most definitely drying for my lips, which is why I don't wear it as often as I would like. Aww thanks Becca:) but it's practically all mascara! I have long lashes but they are pretty sparse- I'm always into discovering new mascaras that lengthen and volumize! Love your blog, Yessie! I'm glad you like the Skin Finish more with the Beauty Blender! It's such a nice easy base when you're in a rush too! Thanks Thelma:) it's def growing on me! It's perfect for this summer scorcher were having! Ps- pls excuse my awful grammar/spelling on one of your post!